Synopsis: As Harry, Ron and Hermione continue their quest to destroy the Horcruxes, Lord Voldemort and his followers bring the battle between good and evil to Hogwarts, for one final showdown. Review: For everyone who read these beloved series of books and went on this epic journey with Harry, Ron and Hermione on the big screen, this is where everything ends (or so we thought at the time!) After going on said journey, spanning eight films and ten years, it was important to ensure that the franchise went out in style, and go out in style, they certainly did. The first part to this concluding story to the Harry Potter universe, while having its few moments of enjoyment was ultimately all set up for this conclusion. We pick up immediately with the events of the first film, with Dobby having bravely given his life for our key trio to help them escape the clutches of Lord Voldemort. For Harry, Ron and Hermione there is no time to dwell, and their search for those elusive Horcruxes continues. The pacing of the first part was a bit slow, as the relationships of our three leads was put under severe pressure. 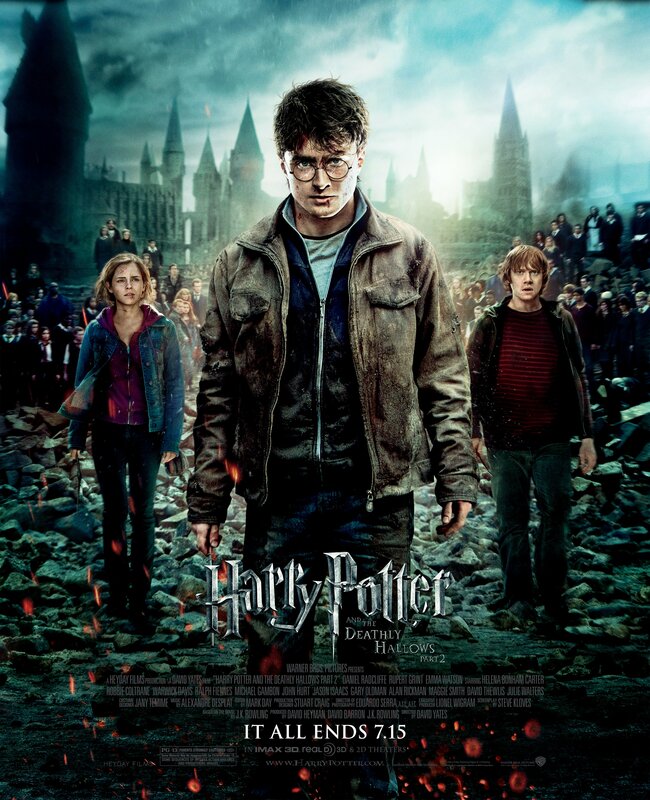 However, now the trio are united in their quest, and right from the off, this film is a pulsating, emotional ride that never lets up and delivers the satisfying conclusion that the legions of Potter fans around the world will have hoped for. The franchise has certainly boasted some remarkable action sequences, but this time around we certainly have the biggest one, and maybe even the best of the lot. Yates once again directs these scenes with wonderful execution, from the Battle at Hogwarts to a brilliant mini skirmish at Gringotts. With Harry having returned to Hogwarts in search of a Horcrux, The Dark Lord moves in to attack, and the Battle of Hogwarts commences. It’s a visual spectacle and Yates once again helms it in magnificent fashion. Writer Steve Kloves also deserves credit for once again adding some brilliant lines of humourous dialogue. The best of these falls undoubtedly to Julie Walters’s Molly Weasley, with a superb line of dialogue lifted straight from Rowling’s novel, it’s wonderful to watch and Walters delivers the line in great style. Image is property of Warner Bros. Yet in spite of the wondrous visuals, this franchise has been built on the characters and there are some truly heart breaking moments where certain characters true natures are revealed. Alan Rickman did a wonderful job bringing Severus Snape to life, but the revelations that are disclosed here show him in a completely new light, and viewers may find themselves reaching for the tissues as Rickman’s performance is so powerful and emotionally heart-breaking, it is undoubtedly his best work in this franchise and reinforces what a wonderful and brilliant actor he truly was. Through all of this magical mayhem and carnage, this franchise has been built on excellent, well developed characters and Snape is one of the many perfect examples of this, with Harry, Ron and Hermione being among many others. Truth be told, every character was brought to life brilliantly by their respective actors, and full credit to each and every one of them for their sterling work. It was quite a journey that we all went on over the course of a decade, watching these brilliant pieces of literature be brought to the big screen. Four directors, eight films and nearly eight billion dollars grossed at the worldwide box office, this is a franchise that captured the hearts and minds of film goers across the world, and although our journey with the Boy Who Lived might be done, there is still much to explore, With a further expansion of the wizarding world having arrived in Fantastic Beasts and Where to Find Them, and with four further films to come, the magic of Harry Potter and this incredible world we have all come to know and love, isn’t going anywhere any time soon, even more so when The Cursed Child is inevitably adapted for the big screen. Sterling performances from just about everyone, some incredible action and breath-taking visuals, the franchise certainly signed off in beautiful and magical style.